Walk down Main Street and hang a right and you’ll leave today and enter the future. Ever the visionary, Walt Disney’s master plan for Tomorrowland was to allow Walt Disney World visitors a glimpse into what the future may hold. After all, “Tomorrow can be a wonderful age,” the man himself once said. When Tomorrowland first debuted in 1971, Walt’s vision for a utopian futuristic land was not yet complete. Two attractions, The Grand Prix Raceway and Skyway to Fantasyland, were just the beginning. Circle-Vision 360 – America the Beautiful, and Flight to the Moon opened shortly afterward. Now in its third generation and continuously striving not to become “Yesterland,” Walt’s vision has endured. 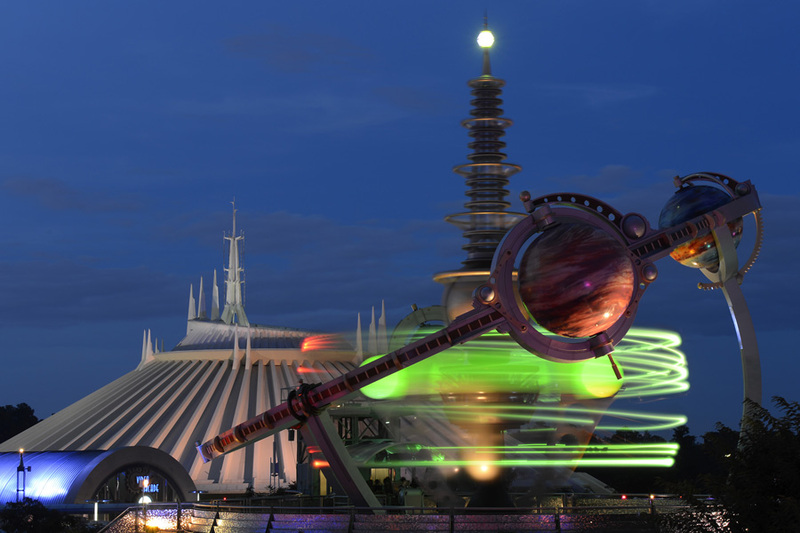 Tomorrowland incorporates many cutting-edge creations alongside legendary attractions such as Space Mountain, all the while maintaining many of the original attractions in various forms. For some (this writer included), there is no greater joy than a turn on the Carousel of Progress, later hightailing it over to Auntie Gravity’s Galactic Goodies, sitting down with a strawberry sundae whilst listening to the roar of cars on The Tomorrowland Speedway (formerly The Grand Prix Raceway). Tip: Be sure to find a shady spot before your sundae melts, as Tomorrowland is one of the Magic Kingdom’s sunniest spots. Boy oh boy what a future! Paging Mr. Morrow, Mr. Tom Morrow!